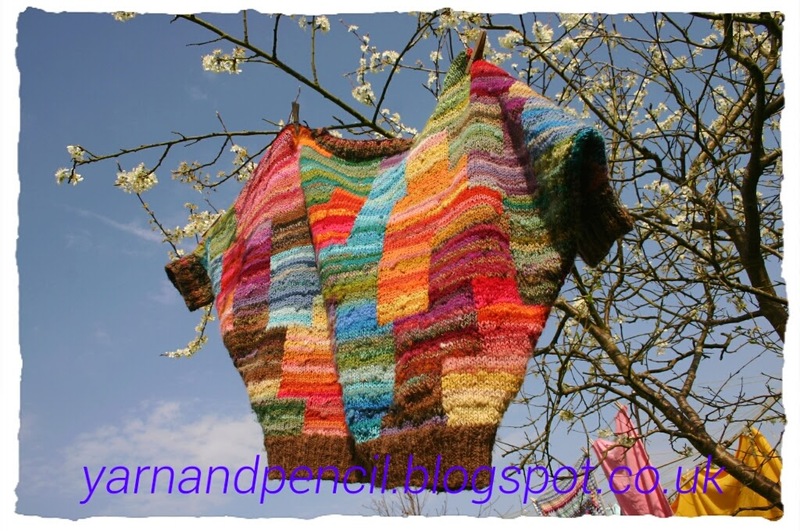 In this post i show you a couple of my knitty creations, catch up with the latest news on those vintage hexies, check on the garden and last but not least, pop into the studio to see what been up to this week with crochet hook..... you may like to join in. I adore colour so it it's not surprising that I drool over the work of Kaffe Fassett and more recently, Cath Kidston. ...and the next to show you is my shawl that I made at the end of last year. I acquired a lot of tapestry yarn... I do really mean a lot! I was in heaven with all that variegated colour. The basic pattern is from one of Kaffe's books where you cast on 3 stitches and increase one stitch at both ends of every row. I had about 450 (approx) on my circular needle at the end. It's so big that the fringe touches the floor...I may remove the fringe and add a crochet border...now that I can crochet. 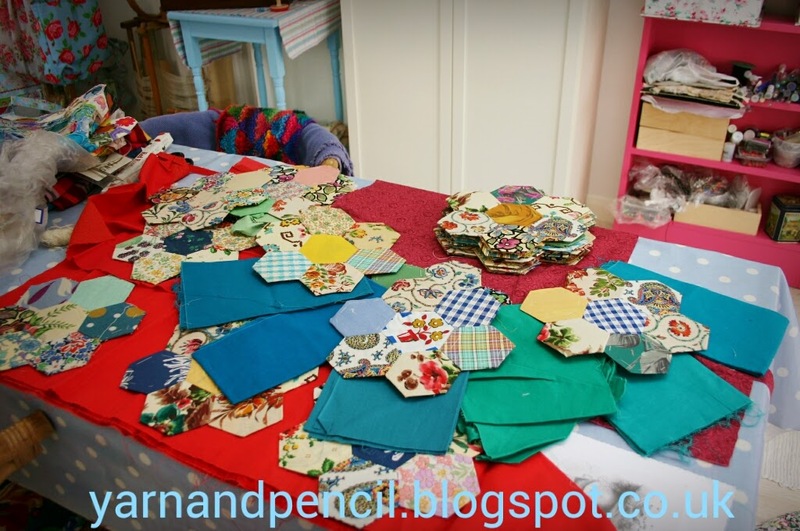 And the news from my studio is that some of my home made bunting is cheerfully decorating my creative space. I made the bunting a few years ago for my 50th. I generally use it outside in the summertime but as I did have an addiction to making bunting at one time, I have plenty for both. On the odd occasion at church I get nicknamed Tracey Bunting!... (It's because I can be a little crazy, perhaps eccentric at times). I'm joining the mand-a-long that the two lovely ladies... Chrissie Crafts and Lazy Daisy Jones.... have instigated, along with the help of Wink. It's my first ever crochet-a-long and I'm rather excited. I've made my first mandala.... I guess I could show it....it's been pressed but not blocked. I used the yarn that Deci gifted me last week. it's from Wink's pattern in issue 14 of Simply Crochet magazine. It's certainly not perfect but as it's my first I'm not worried in the least as I will be hooking some more for sure. It's a fab pattern to follow and it's completely my fault that I didn't get it right as I didn't count stitches... do I hang my head in shame.... No way, as I had such fun hooking it! And anyway, if you only see perfect ones and you are a beginner like me, it could put you off trying and then you'd miss out on lovely hooky joy...... and what a shame 't'would be. Hi Joy, it's always so lovely to hear from you. Thank you. What beautiful projects. I particularly like the shawl, it was stunning, the colours were amazing. Gosh, what a bumper filled post! I love the batwing jumper. I had an awful lot of those in the 80s, although, it's funny how it all comes around again as my last few makes have been batwing! the shawl is amazing too. 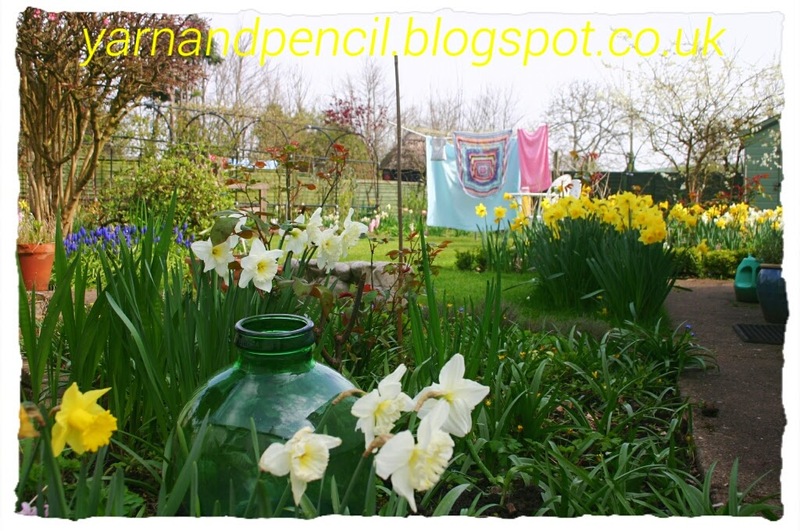 I took down my garden bunting at the weekend as it was looking a bit sorry for itself, so it's on the list to make some more for the warmer months. Lets hope we get some! ha ha! 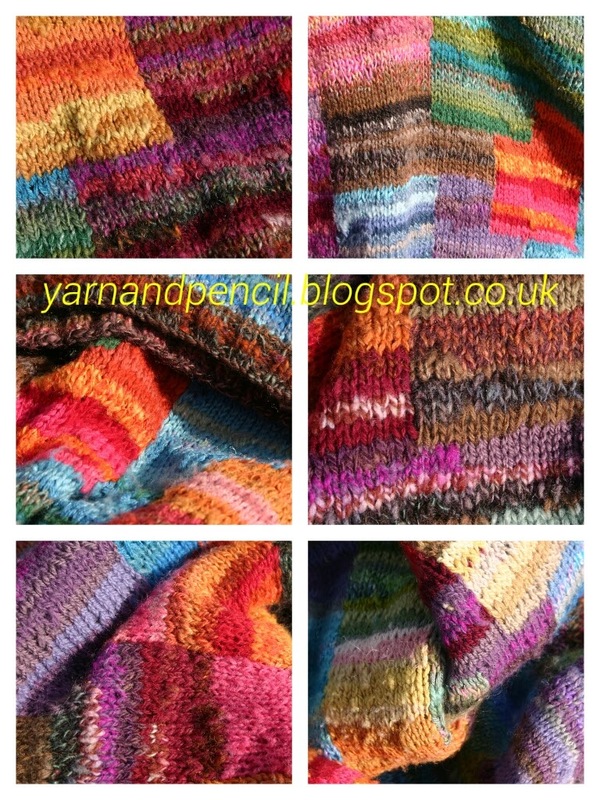 Tracey this post is full of great projects, it is amazing that a mish-mash of so many different yarns as used in the batwing jumper turned into such a beautiful display of colour. 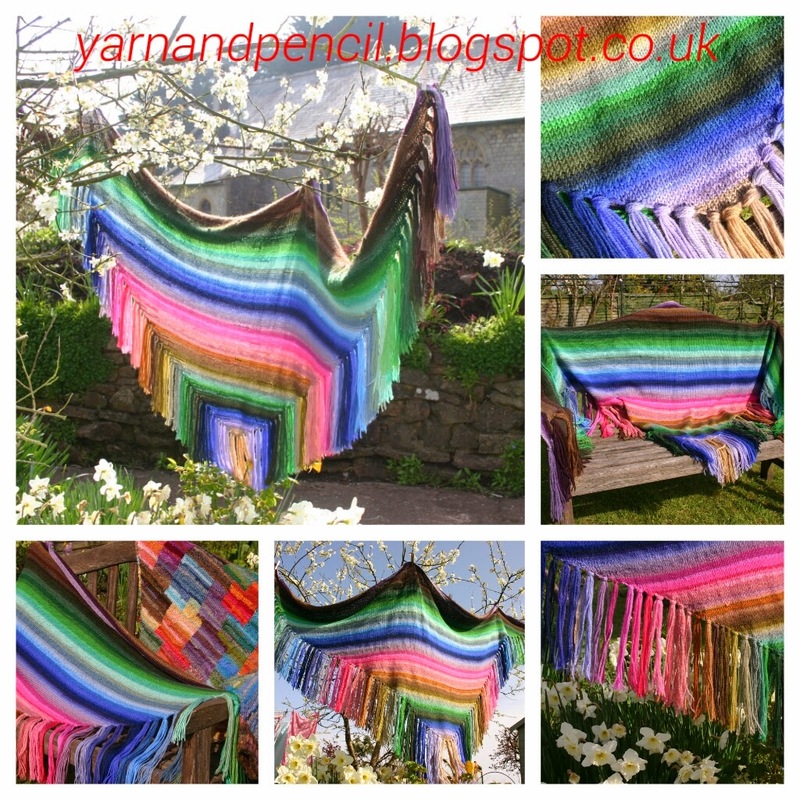 You have put your tapestry yarn to such good use, the shawl is vibrant and has a beautiful drape too. I would imagine this project took a long time to complete, well done for finishing it. 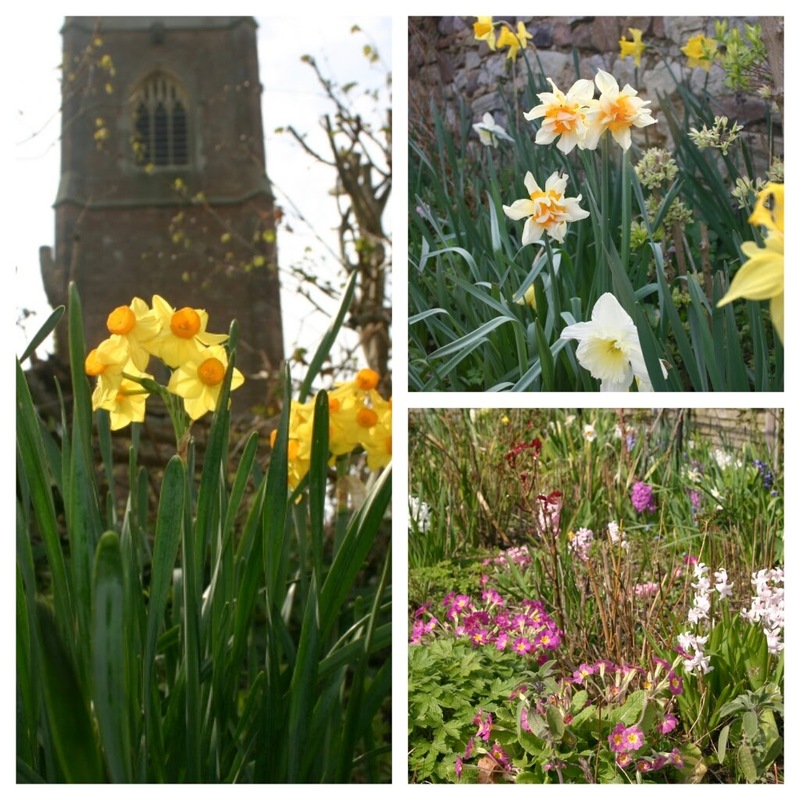 Your spring garden is lovely, my garden is in the middle of a make-over at the moment, a blank canvas too with no plants at all yet except a very awful weedy lawn. This is our work in progress for the coming months. It is a very small garden and I quite fancy having an edible patio with fruit and tomatoes in hanging baskets. The bunting is so cheerful and it makes your home homely, so uniquely you. Well done with your first attempt at the Cal, I've never done a crochet-a-long either and I look forward to your progress with yours. Thank you for your lovely comments Linda. We inherited or garden from an elderly woman who lived here previous to us so most of it is down to her. We are gradually putting our own stamp on it (as they say). 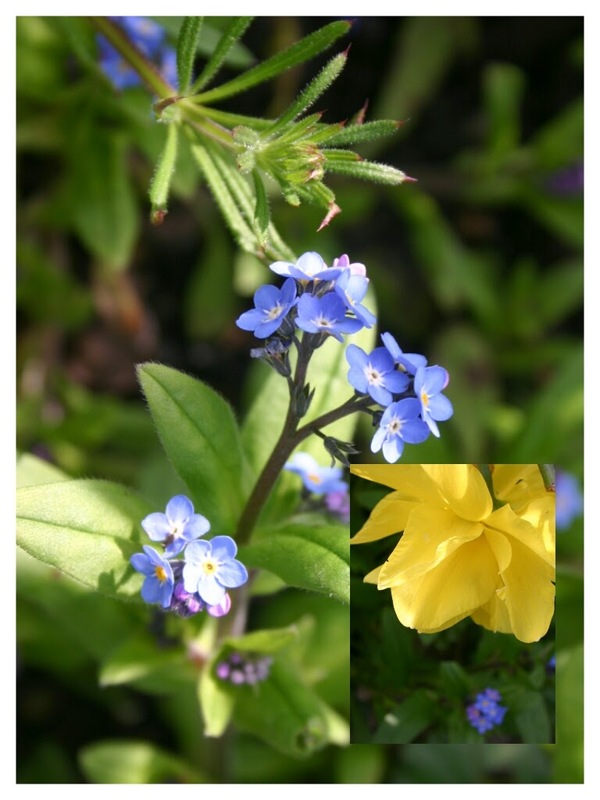 The plans you have for your own garden sound lovely. I'm not quite sure what is expected of a Cal...but I thought it would a great way to get to know people a little better... haha....I just went and jumped in without thinking about it really! A lovely colourful post! 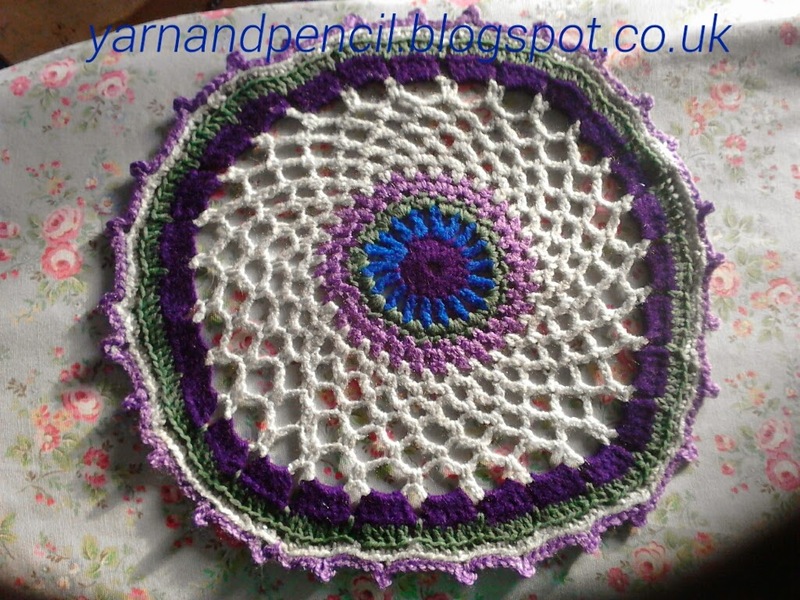 Your mandala is lovely, I am still deciding whether I should start one as I already have way too many projects on the go. Thank you for you lovely comments. Re making a mandala....Perhaps just make a small one....? I think I shall use cotton when I make my next one....I'm looking forward to it. I think I'm going to look for a blue background as that cheers the vintage fabrics rather than making them look dowdy. Our cottage sitting room is a bit on the dark side so I have to be careful with colours in there because they can easily look very old but not in a nice vintage way. I do like the sound of the quilt you saw in the book. ...says there are over 100 pieces. It's on for a good length of time so maybe I will have a chance to see it after all later in the year. All so yummy and colourful!! Thanks for sharing... 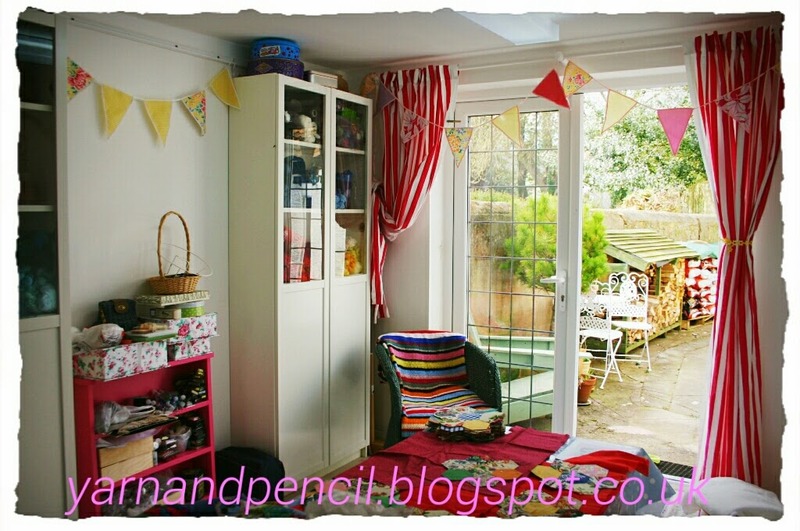 I love the way your studio opens onto the garden -- what a lovely space!